Empty, cold, windy, the beach in the winter. I walk down a deserted shore with the waves rumbling next to me. Little evidence of life except for a stray gull or a few eider ducks diving just beyond the surf zone. The wind whips sand particles stinging as they hit my face. Walking into the wind takes some effort. Geographically, this is a beach I visit often, but it is a very different beach than the one I walked on in the late fall. Winter storms, wind and waves have continued with their eternal reshaping of the landscape. 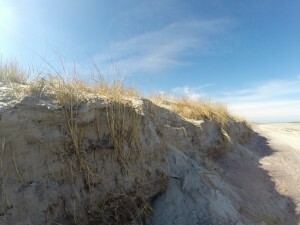 Large sections of sand dunes have eroded in one of the winter storms. The constant wind redistributes clouds of sand along exposed sections of beach. Sand grains collect in clam shells, behind clumps of dune grass or debris, any place that allows relief from the vigorous wind. In my lifetime, I’ve seen nature’s reshuffling of this beach dozens and dozens of times. As I stroll along the shore, I contemplate the fate of a grain of sand. How many times does a single grain of sand get moved in its life span? How far does it travel in its lifetime? I envision the grain of sand being blown down the beach by the wind and moving in and out on a wave or with the tide. The one constant for a sand grain is motion. The one constant for most beaches is change. With climate change triggering sea level rise and more intense storms, this current rate of change will also change. It’s time to turn back and as I retrace my steps from the way I came; the wind is now at my back. With the wind at my back, nature doesn’t seem quite as violent. The waves coming ashore don’t look as big. A gull floats effortlessly above me on the wind exerting no effort at all, appearing at peace. The deeper message seems pretty clear, we need to work with nature not against it. Are we as a society, sand grains being blown around haphazardly by the wind or are we the sea gull who can adapt and use that same wind to our advantage? In the distance, three wind turbines are visible on the horizon.